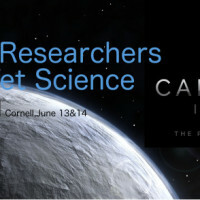 We are pleased to announce the 2nd Emerging Researchers in Exoplanet Science Symposium (ERES) to be held June 13 & 14, 2016 at Cornell University in Ithica, NY. This is the successor to a highly successfull ERES meeting at Penn State in May 2015. ERES is aimed at early career scientists (graduate student, postdoc, advance undergraduate) working in all branches of exoplanetary science and related disciplines (e.g., brown dwarfs, protoplanetary disks, star formation, related instrumentation and theory). Its purpose is to give these emerging researchers the opportunity to present their research to an interested audience, to provide plenty of opportunities to network with peers, and to enhance collaborations within exoplanet community. ERES will be held annually on a rotating basis between partner institutions, including Penn State, Cornell and Yale University.